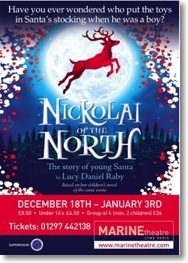 In early December 2009, with just over a week to go before the first rehearsal, Ian Stephens, Artistic Director of the Marine Theatre in Lyme Regis, e-mailed me and asked if I would be interested in a ‘challenge’ - to write the music for the songs of Nickolai of the North - an adaption by the author Lucy Daniel Raby of her best selling childrens novel. Due to unforeseen circumstances, the composer who had been initially approached to write the music was unable to do the task. Between the matinee and the evening performance on the 2nd January, we recorded all the songs and now present them here for you. The Cast were simply amazing learning these songs at short notice and delivering them with such conviction and clarity. The musicians, Steph and Jenny, gave the accompaniment a very warm interpretation to a very high standard. Finally, a special thanks to my wife Liz, who had to put up with my absence while I got my head down to write the tunes and tore my hair out. The occasional ‘ear-wiggle’ did help. Now select a song from the list on the right and see the score and / or listen to the recordings - I hope you enjoy listening to the songs. PS The songs are numbered as they are in the original script.